THE BIG BANG THEORY’s Leonard (Johnny Galecki) finds himself in charge of doling out extra grant money…which, certainly, is going to draw the attention of his friends. 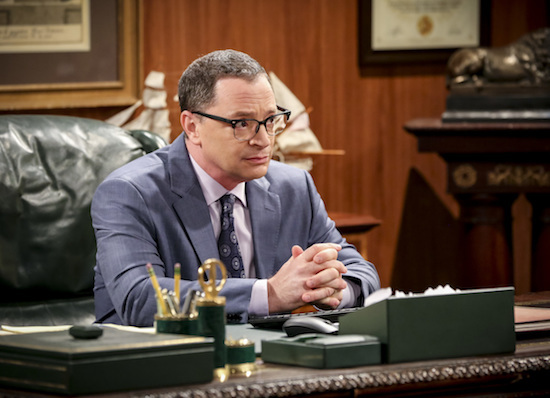 "The Grant Allocation Derivation" -- Pictured: President Siebert (Joshua Malina). Leonard is caught between a rock and a hard place when he's responsible for distributing extra grant money. Also, Bernadette turns the backyard playhouse into a hideaway from her husband and kids, on THE BIG BANG THEORY, Thursday, Nov. 1 (8:00-8:31 PM, ET/PT) on the CBS Television Network. Photo: Michael Yarish/Warner Bros. Entertainment Inc. ÃÂ© 2018 WBEI. All rights reserved. THE BIG BANG THEORY, Thursdays, 8/7c, CBS.